There were three things I wanted to do in Los Cabos last week, when I was on vacation with my family. One was lay out next to the water, drinking a margarita and watching the ocean crash against the cliffs. The second was assist in a sea turtle rescue. (We were too late in the season.) The third was to visit Cacti Mundo. We didn't make it to this magical oasis, unfortunately, but I still want to see it. Am I interested in the cacti? Empirically, yes. They have a magnificent self-defense system and can be eaten in a hundred different ways. (Although I still don't want one on my desk.) What I also want, though, is to meet the people so committed to these succulents that they refer to their garden as a "shining beacon of beauty." I am telling you this to explain some things about the birth of Jesus, and why one of my favorite holiday songs of all time is Extreme's "Christmas Time Again." When I think about Extreme, I think about my uncle, my father's youngest brother, who lived with us for a while when I was four or five. He was packed off to live with us by a family friend, Aunt (dì/chị) Phu, who wanted my father to make sure that his sibling stayed out of trouble and went to class. My uncle was probably in his late teens or early twenties when he lived with us, and in my memory, his aesthetic then was straight out of Wayne's World. I think he had a spiky mullet thing, and I'm pretty sure he wore shirts with the sleeves torn off. He smoked. I have a fairly vivid memory of some argument about beer cans, mostly because "my five year old daughter" (me!) was mentioned. In short, he was living with us for a reason. It's also a band that, if their one holiday song is to be believed, feels really strongly about the meaning of Christmas. "Christmas Time Again" is a song that can only be found on one of my very favorite Christmas albums, 1992's A Very Special Christmas 2. I like it, first of all, because I think it's gorgeous - it starts off with this epic synthesizer/pipe organ thing, cuts away to a melancholy piano backing that somehow manages to be in a major key, and goes back to a chorus with a cappella-style harmonies. 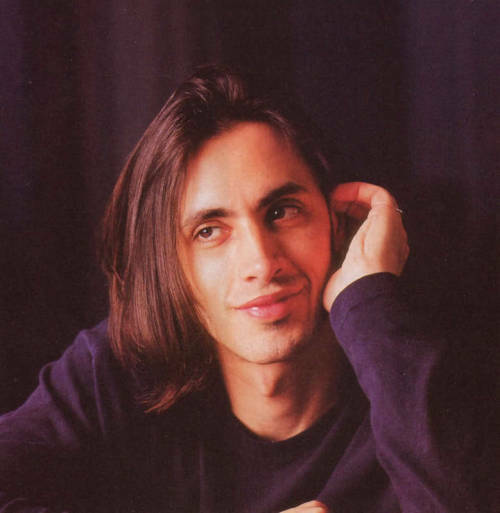 It also features the vocal stylings of (I think) Nuno Bettencourt, who a) has an amazing name and b) was kind of a fox back in the band's heyday. How come we seem to push it all aside? It only gets more intense from there. Because our narrator feels that this needs to happen sooner rather than later, and that someone has to step up, he offers to make a few modifications for us. That's right. This man is so committed to retaining the Yuletide feeling that he offers to rearrange the way we perceive time. This is a song that is both completely a product of its era (an era that included hair metal) and completely, utterly sincere. These are tough men, men whose band logo appeared to be hewn by a seventh grader with a pocketknife. They are men whose jeans are torn. And when it comes to the question of brotherly love, they will smash a guitar over your head if that's what it takes to convince you. Hannibal Buress (again!) has a joke about how people will say that something is upsetting on "so many levels." He claims that this is overused, and to prove his point cites a bunch of different potential levels ("metaphysical level, eye level, Level Three, sea level"). I hate to say this, Hannibal, but there are different levels at which I like things, and they're all valid. (And none of them are sea level.) For example: I can like something for what it is. I like learning about cacti, and I like the idea of helping out with some sea turtles. I like this song because it's pretty and fun to sing. Those of us who celebrate Christmas from a religious perspective like it because it marks the birth of Jesus Christ, who, as the Son of God and an all-around good guy, is fairly important to the faith. And, finally, there's something to be said for open effort. Most people probably do not like cacti. They're not exactly lovable, and they're associated with the kind of environment that kills a man in three days or less. But the people at Cacti Mundo not only love these plants, they proclaim their greatness to a degree that borders on absurd. Extreme doesn't just believe in loving one's fellow man at Christmastime; they created an arena rock chorus about it. In the Bible, God didn't just talk about his love for humanity; he came up with a plan that, on its face, sounds a little bizarre - impregnate a sinless virgin with a Messiah, have him start out as a borderline refugee, and give him roughly thirty years to get people on board with the idea of loving each other before setting him up for an inevitable death. Oh, and have him convince everyone of his divinity by having him come back from the dead, which was probably not at all creepy to the average Elihu or Hepzibah at the time. When we see others who are unafraid to commit to something we find strange, it's admirable, and a useful reminder that we may not know as much as we think. It keeps us humble. *Apparently the name actually comes from the fact that two of the members were in a band called Dream, and "Extreme" comes from "Ex-Dream." This is ridiculous enough that I'll still give them credit. **Another excellent example of this is Bob Seger's cover of "The Little Drummer Boy," which adds new meaning to the verses "I played my drums for him/I played my best for him." It accomplishes the feat of adding both softness to the idea of the Silver Bullet Band and a certain layer of grit to the Nativity. Joseph was blue-collar. Why wouldn't he have liked classic rock?